The Citadel of Tiryns is located on the mainland of Greece off from the cost of Mediterranean Sea; it is 10 miles away from Mycenae. Unlike Knossos, Tiryns was built mainly to be defensive, since it did not suffer from the ravages of earthquakes like Knossos it did not have phases and grow in the organic manner as Knossos did; it was planned from the beginning. There are heavy walls surrounding Tiryns and other Mycenaean palaces. 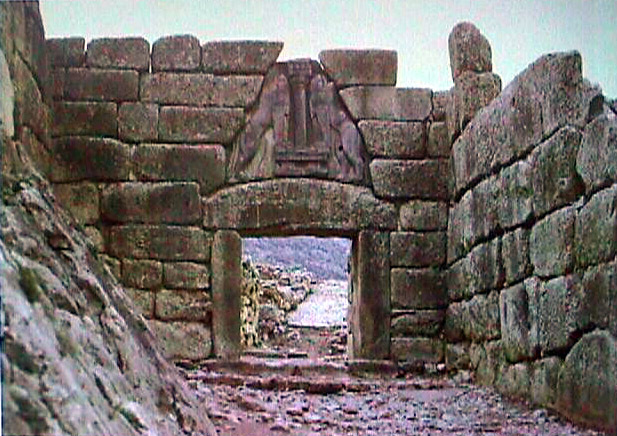 The entranceway to Tiryns is also designed to be defensive. In order for the attackers to approach the palace they have to pass a series of long narrow ramps that forces the soldiers to turn to right to expose their unshielded sides. 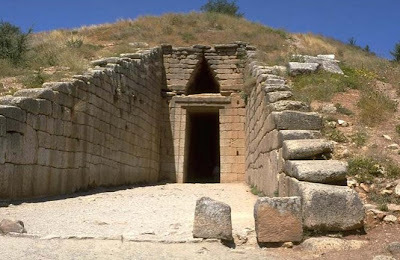 Not much is known as to why Tiryns or Mycenae died, however, it is known that they were under constant attack and that Tiryns and Mycenae both ended, probably by fire, in 1200 BCE. The Greeks of later periods were quite taken with the ruins at Tiryns and even then it was a place of legend and fascination. Hercules was said to have been born in Tiryns and second century CE Greek historian Pausanias even wrote a tour book about its gigantic towers and masonry. There’s a romantic story about the life and times of Heinrich Schliemann who was the archaeologist who excavated what he labeled the city of Mycenae and also another city called Tiryns. 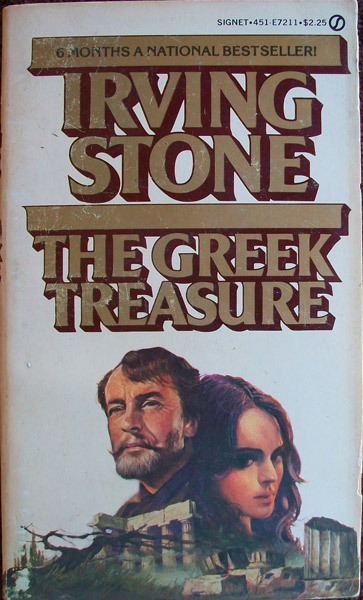 The book “The Greek Treasure,” by Irving Stone depicts Schliemann as a groundbreaking hero. He is in a lot of ways. Like Evans who excavated Knossos Schliemann was a very well-informed thoughtful man who knew a lot about the ancient world. 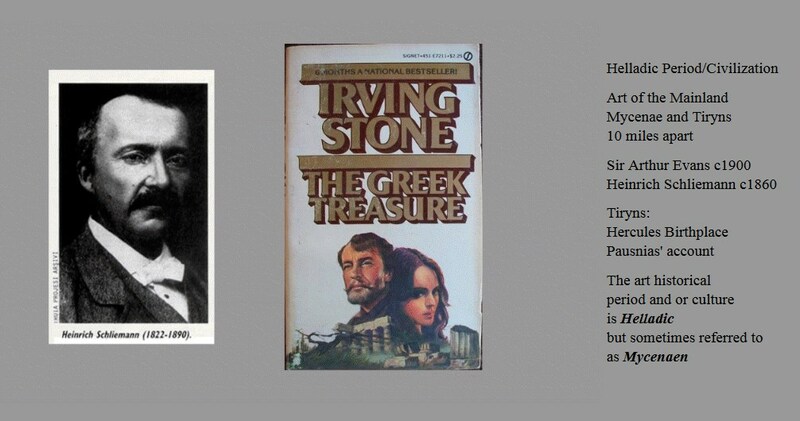 He started as a businessman who had a passion for the books of the Iliad and the Odyssey. He made enough money that he was able to follow his passion and without the help of an academic institution he became an archaeologist on his own. He was not without a basic set of skills which included knowledge of Greek, ancient Greek, and several European languages. He is also known to have memorized the entire texts of Homer’s books the Iliad and the Odyssey. There is a wealth of contextual analysis about how Schliemann did his excavations in Irving Stone’s book. The big takeaways from this are that Schliemann was not very systematic in how he excavated the site that he found. He did not use stratigraphy which is a modern archaeological method that archaeologist used to divide the site into quadrants and document everything found in each plane of the quadrant. 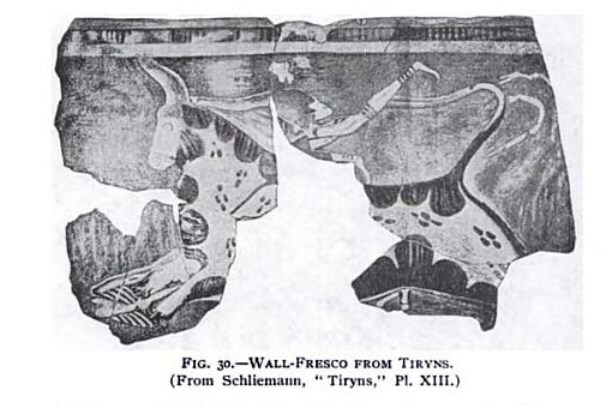 Schliemann also reconstructed some of the things he found at sites, much like Evans did at Knossos. The problem with both archaeologists work is that it may not be as accurate as we would like. Since the site is already been excavated very little new information can be extrapolated from the site itself. A great way to get a sense of what the values of a culture are is to look at how the designed their cities. Knossos on the right-hand side was a city that was located on a defensible island. It’s also thought that the Minoan culture had such a strong Navy that no one would dare invade or attack the central island of Crete or even the Cycladic islands around the area. On the left-hand side we see the Mycenaean city of Tiryns. In comparison, the city is actually a Citadel which is a defensible Palace with living areas as well as governing spaces. There’s really only one way to get in and that’s through the place called the outer propylon, that’s Greek for Gateway. The way in which the long thick walls are arranged means that anybody who was attacking the city couldn’t get in through the thick outer walls and if they were storming the city they would have to go through the approach ramp and make a right turn into the gateway. The fact that they’d have to turn right is a significant strategic move in the ancient world since the warriors of the ancient world, especially Mycenae, were hoplite warriors. A hoplite warrior is a soldier who was taught how to fight side-by-side while interlocking shields with his neighbor. The shields were oval and would allow the interlocking phalanx to move forward in step and stab their spears through the space between the shields. They would wear armor on their arms called Greaves and they would also wear a helmet. Here is a depiction of hoplite warriors from a Mycenaean vase. See the movie “The 300” to see this in action. Hoplite warriors need their right arms to be free to use their spears. Hoplite warriors entering the gateway would encounter a 90° right turn have their arms blocked by the stone walls. This would also leave a gap between the shield and and the wall. The warriors who would be defending that gateway would have their right arms free and would be able to exploit the weaknesses of the offensive forces. Another benefit to the thick tall stone walls is that the people defending the Citadel would be able to stand on top of them and throw things down on top of the advancing army. 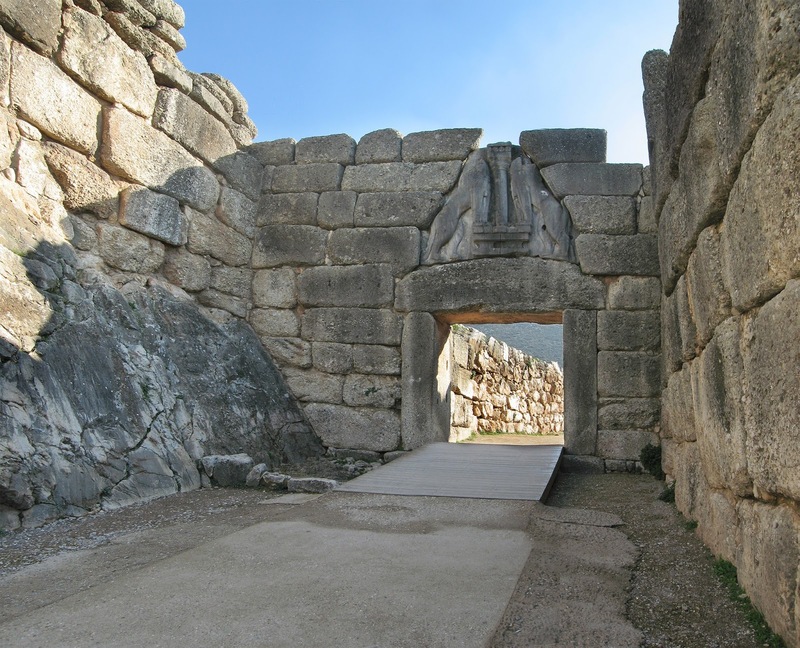 So the design of the thick walls long hallways and high vantage point are all elements integrated into the design of the Mycenaean city. Form: By the shape we know that this vessel was a mixing bowl for wine and water that the Greeks called a krater. Created on a wheel the vase is decorated with fired engobe. Engobe is a glaze made of thinned down clay sometimes called slip which has additives such as iron oxides which turn colors when fired. A single register of warriors complete with armor marching from left to right. To the far left is a female figure waving at the figures as they move away. As in the Minoan art, no attempt at pictorial depth is apparent. The figures seem to be rendered in an attempt at naturalism and whatever stylizations occur they do not seem wholly intentional. The figures are in a modified composite view for this reason as well. Iconography: The iconography of the vessel seems to fall in step with the overall plan of Tiryns. The theme of the vessel is martial. These are men going off to battle and the female to the far left is in support of their patriotic venture. Therefore the iconography describes both male and female roles within the context of a militaristic society. Context: Since both Mycenae and Tiryns were built for defense and the fact that a household item, unlike the pottery from Knossos, contains such a martial theme indicates that the emphasis of the cultures at Tiryns and Mycenae were devoted to defense. The positioning of the shield and spear in the arms of the individuals is also a clue as to how the walls and entranceway into the citadels was defensible. Since an intruder would have to enter the main gateway (propylon) by turning right, the spear hand of the soldier would be blocked by the wall and the shield on the left would be rendered ineffective as the soldier turned. A soldier inside the propylon would have the benefit of having no such obstructions. 1. a squared building stone cut more or less true on all faces adjacent to those of other stones so as to permit very thin mortar joints. 3. masonry made of them. 2. Carpentry. a short stud between joists and sloping rafters, especially near the eaves. 3. to face with ashlars. The walls themselves are constructed from large interlocking ashlars of masonry. The blocks are enormous and some of them would take several men possibly even a pulley and winch system to raise them into place. When the ancient people of Greece found these sites they describe them as looking as if the gods had constructed them. At least the demigods because they named this kind of masonry “Cyclopedia Masonry” because the stones were so large they assumed that one eyed giants called Cyclops constructed the city. The Cyclops is a mythical creature that will encounter in much of the art from ancient Greece. There are two of them and one is named Polyphemus who is a character in the Odyssey of Homer from 800 BCE. Odysseus encounters the Cyclops as he returns home from his war on Troy. 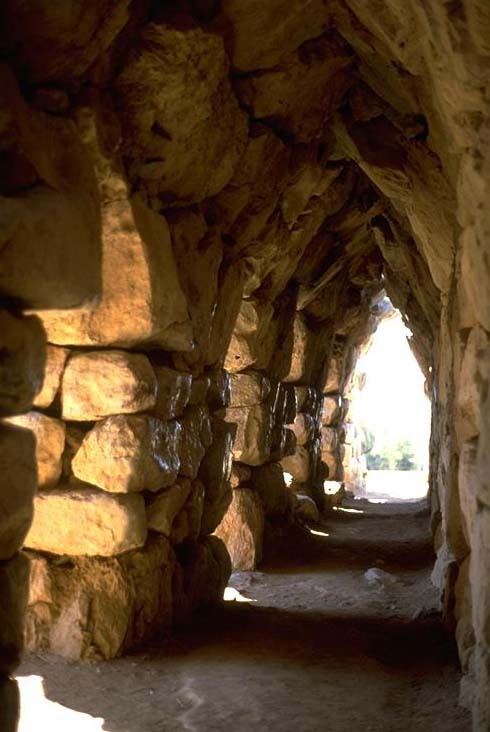 These long pointed arch tunnels are an early form of arch called corbel the arches. 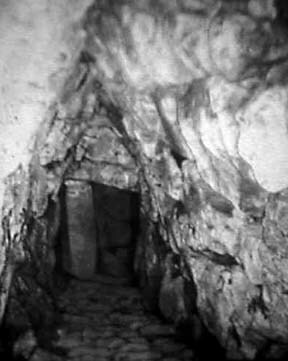 A corbel arch is very similar to an upside down stairway, we’ve seen corbel to arches in the interior of some of the pyramid that we studied.. It is a very simple form of arch that is basically an upside down the or you in which the stones meet at a sharp apex. This is the dominant style of arch making in ancient Greece until the time of ancient Roman architecture in the first century BCE. A corbel arch (or corbeled / corbelled arch) is an arch-like construction method that uses the architectural technique of corbeling to span a space or void in a structure, such as an entranceway in a wall or as the span of a bridge. A corbel vault uses this technique to support the superstructure of a building's roof. 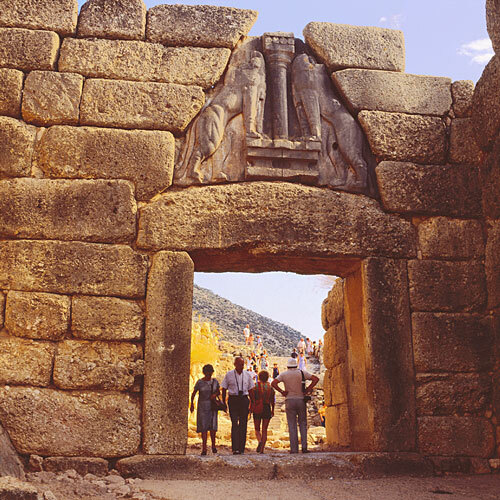 We do not know how the people of Tiryns and Mycenae viewed their own cities since there is isn’t a written account. We do know that these cities were iconic for the Greeks and Romans who saw them centuries later. The massive walls and masonry blocks of Tiryns were gigantic. They are so massive that Greeks and historians imagined that giants moved and built the blocks. The giants elected by the Greek imagination were the one eyed titans known as the Cyclopes. That is why the term Cyclopean masonry is used to describe it. In some ways, these citadels, for the Greeks of the fifth through first centuries, are roughly the equivalent of Teotihuacan in America for the Aztecs or the Anasazi cities for the Navajo. 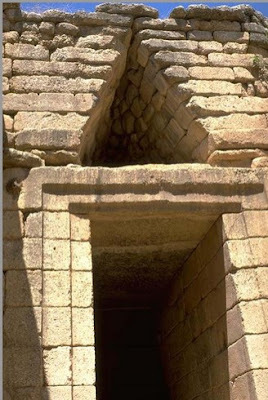 The way things are carved in the masonry, such as in this relief carving above the post and lintel doorway of the gateway into Mycenae tells us something about what the Mycenaeans were trying to communicate to visitors as well as the people who lived there. This is one of those gateways that would’ve been very defensible. As you enter into it you’re funneled into a fairly wide passageway that has large Cyclopedia masonry walls on which defenders could stand and fling nasty things down on your head. It also serves as a bit of a waiting room for those who are waiting to get through the gates. Above the large post and lintel doorway is a relief carving that amplifies the architecture in some ways. There are large alternating ashlars of 4 foot to 5 foot tall blocks of stone that have been laid in alternating courses. The stone is native and would’ve been carved probably on site and fitted together on site. A large post and lintel doorway exists out of three eleven to twelve foot long blocks of solid stone. Above this is a carved plaque or stelae in a triangular form. The large plaque is made of a limestone and more finished or “dressed” then the rougher masonry that surrounds it. The overall shape of the plaque, which is similar to the tympanum found on Christian churches, is roughly triangular and designed to fit in with the triangular spaces above many of the doors at Mycenae. You might describe the arch above if it was complete as a corbel arch. 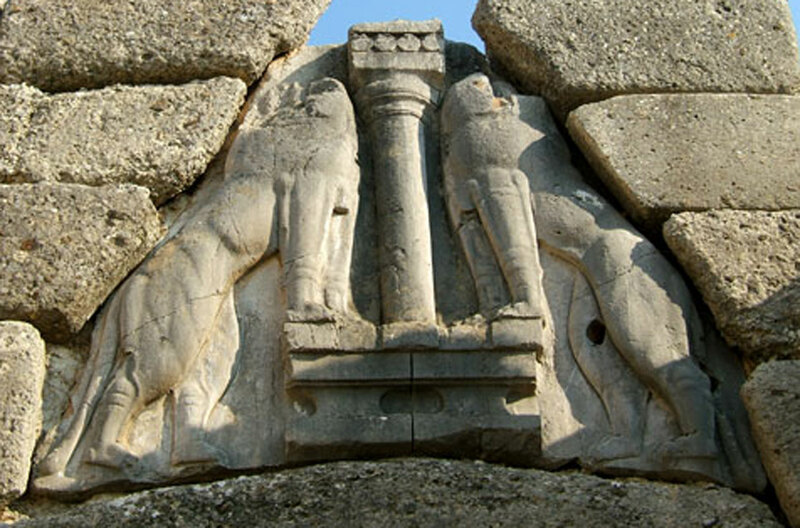 The stelae represents lion bodies flanking a column that has a capital at the top and entablature that looks very similar to the columns from Knossos. In fact the shape of the column is that above the columns capital is a flat entablature decorated with what looks like patterns and forms that are similar to the ones that we see at Knossos. They are patterns based on geometric forms circles and rectangles. The lion or feline animals are missing their heads. We don’t know if the original heads depicted lions. It’s possible, and probably very likely, that this sculpture was painted with some sort of encaustic paint. Encaustic paint is one of the earliest forms of paint that was used to decorate buildings and sculptures. Encaustic is made from melting beeswax and mixing it with mineral pigments. The melted wax is applied while still hot and then when it dries it becomes a semi-permanent wax coating with color. Since beeswax is organic only traces of color exist in most ancient sculptures that been painted with it. The lion bodies are very naturalistic and seem to be based on some sort of observation of cats bodies. It’s also possible, since there are very few kinds of liens except for mountain lions in ancient Greece that these liens were modeled on some sort of art that was imported. Many buildings throughout the world have animals at the gates to it or on the steps to it. For example there are kinds of dog dragons that are on the front of some Chinese temples. There are also lions on the steps of the New York City public library. In most cases we think of these things is purely decorative but they do have some sort of symbolic significance. In Knossos we encountered a griffin that was a compound creature made of the body of a lion and had Eagles or predatory birds heads and wings. We’ve also encountered liens in ancient Egypt as well as in our own culture in which liens often represent some sort of King or monarch. The mask is a stylized portrait of a mature male. The arching eyebrows and straight nose are reminiscent of some of the objects found at Tell Asmar and Knossos. The mask is made of a thinly beaten sheet of gold which was hammered from the backside. This technique, known as repousse, is different from the other metal working processes, such as the cire perdue method (lost wax). 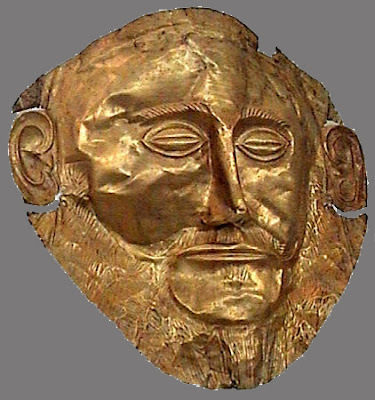 The attribution that this was an actual representation of the ancient Greek King Agamemnon is probably incorrect. 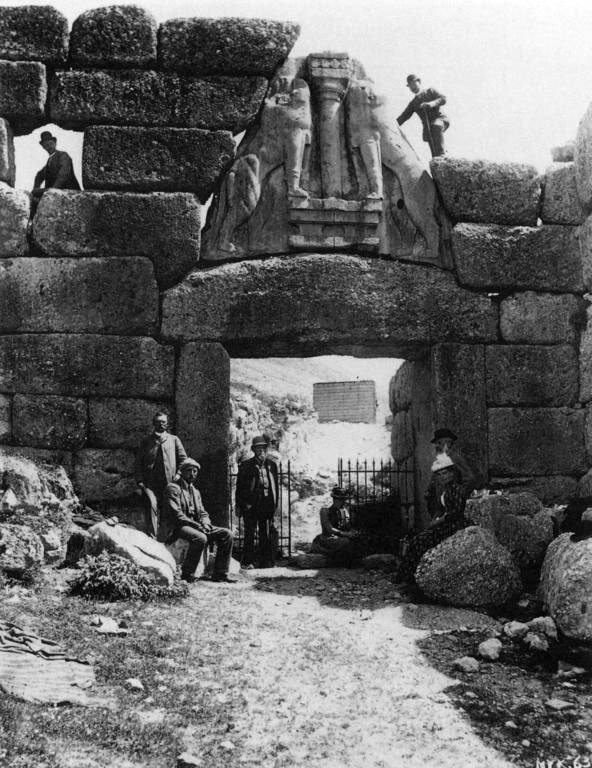 When Schliemann excavated this he had already in his mind decided that the sites he was excavating were both cities from the ancient document of Homer’s Iliad and Odyssey. The reality is probably that this is not any King that Schliemann could’ve named, and the fact that we don’t have any primary documentation such as Linear B texts. The masks were most likely meant as royal portraits of the deceased they covered. The beard and handlebar mustache are emblems of maturity and wisdom. 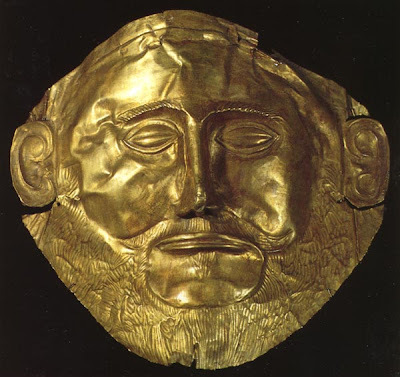 Looking at the so-called mask of Agamemnon in comparison this cire perdue a representation of Sargon, will help us to understand some of the basic concepts involved in making art for royalty. In both of these cases they share quite a bit of formal stuff. The arching eyebrows the beard and the fact that they’re both portrayed as idealized and handsome is no mistake. In most cases in which rulers are represented, such as in the case of the Mesopotamian effigy, the idea is to represent them at their best. So in this case it’s probably standard iconography in most cultures to represent them as bearded. It’s also possible, really more of a theory, to link some of the stylistic traits between these two representations. In order to do this we need to look at context and form together. Art historians have a term, that’s actually outdated and outmoded but is still used today, called Orientalism or orientalized. When they use the term orientalized they are referring to the stylization that we see from Mesopotamia and sometimes in Egypt in which the eyebrows terminate in the bridge of the nose in an almost on naturalistic way. The term orientalized was used by art historians to describe any work that they deemed came from the East. This includes the near East, such as Persia and Mesopotamia, and sometimes can include places like Asia minor and others. Basically, that vocabulary term is a little bit Eurocentric. It’s based on what Europe’s concept of what the East is. So in this way we see that Sargon on with his regular geometric sized curves in his beard and the way the face is stylized is a good example of the orientalized style. It’s possible that the mask and some of the art that we see from Mesopotamia as well as Knossos and Mycenae were influenced by trade and some of the artist picked up some of the stylistic traits that they saw in some of the import goods from Asia Minor, Egypt, and Mesopotamia. Originally this mask would have been molded to form around the head of the corpse serving as a replacement or protection for the deceased features. This mask and others like it were found in the unlooted shaft graves inside grave circle A. The title or attribution that this is the mask of the legendary king from the "Iliad" Agamemnon is false. Schliemann chose to name it this based on his conjecture and desire that he link this site and these graves to Homer's works. The context in which these were found is that they were found in one of the grave shaft’s that had not been plundered by earlier treasure seekers. The actual date is probably around 1200 but there is no way to accurately date these objects. This is one of the few remaining treasure cachets that Schliemann found. 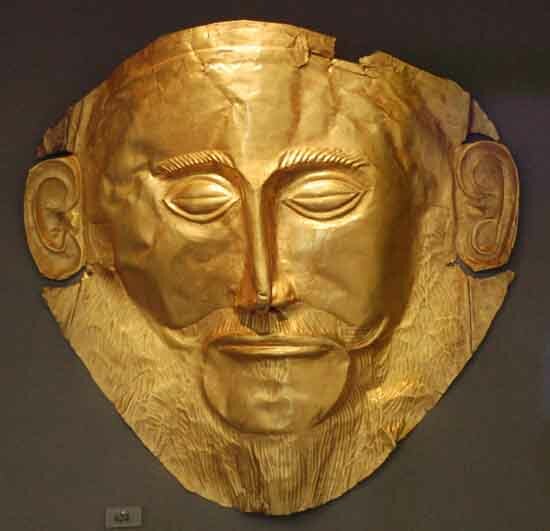 So in a way in order to support his theories he had to name this Agamemnon’s mask. Further problems are that some art historians have accused Schliemann a remolding the mask especially the mustache to conform to his idea of what Agamemnon looked like. 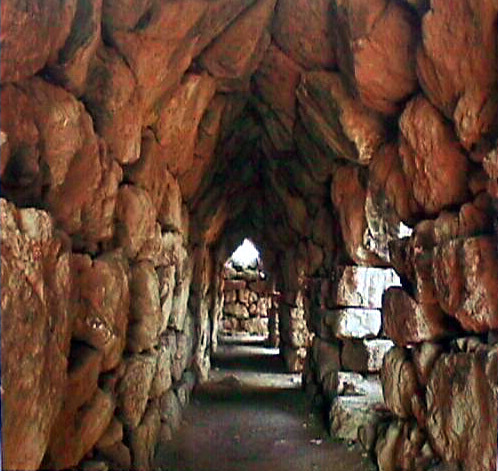 Form: The beehive style tomb was entered into through a 20 foot wide and 120 foot long dromos (passageway) constructed of ashlars that was open to the sky. The entrance to the dromos terminated in another 34 high entrance facade that contained an 18 foot tall door faced with marble and bronze. 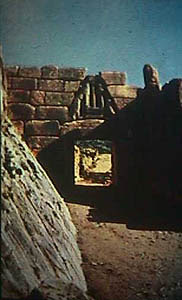 The panel above the lintel, empty in this photograph, would have been ornamented with a similar style limestone or marble panel to the one above the lintel at the "Lion's Gate." Inside the tomb, at 43 feet high, this dome or tholos (tholoi plural) was the largest dome of its time. The interior of the igloo style dome was constructed from a series of corbeled ashlars that terminated at the top in a pointed cone like shape. These tombs were originally covered by large mounds of earth. Iconography: The use of the technology itself is rather iconic of the advanced quality of the engineering and of the wealth of the individual who was buried inside. This "conspicuous consumption" would have been symbolic of the power of the individual. 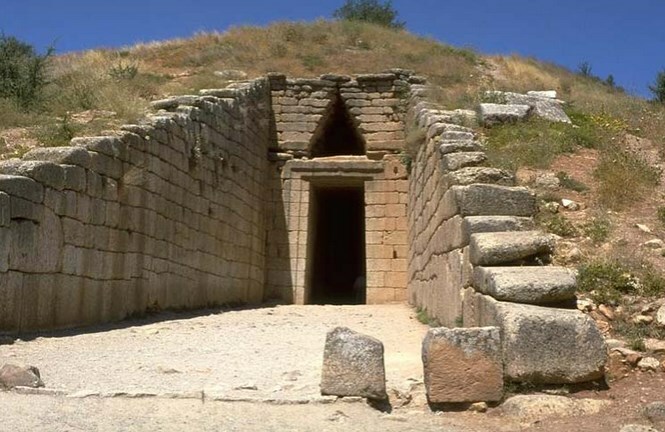 Context: Over 100 tombs like this have been found in the area of Tiryns and Mycenae. However, these tombs, almost all which have been looted, were not the tombs in which Schliemann and others found their treasures. 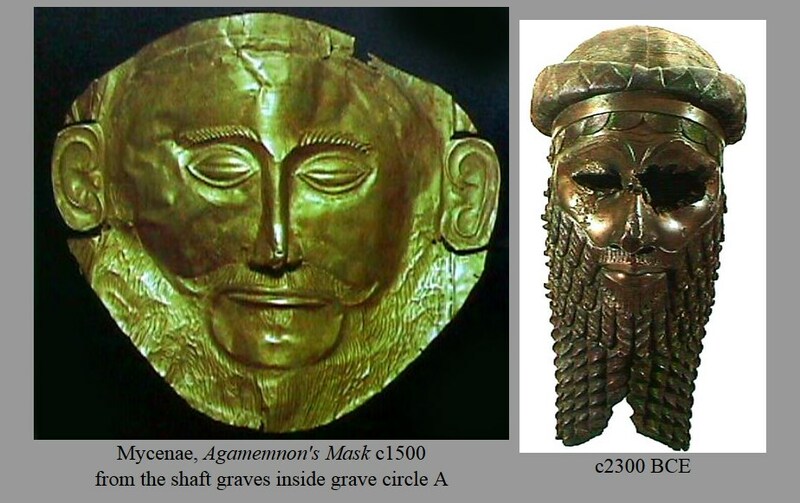 The earlier shaft graves are the sources for the repousse masks. 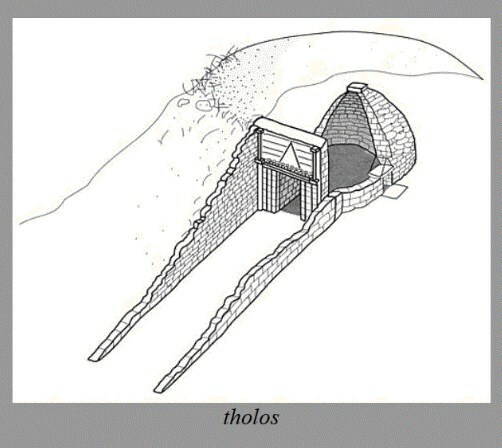 The beehive style tomb was entered into through a 20 foot wide and 120 foot long dromos (passageway) constructed of ashlars that was open to the sky. The entrance to the dromos terminated in another 34 high entrance facade that contained an 18 foot tall door faced with marble and bronze. 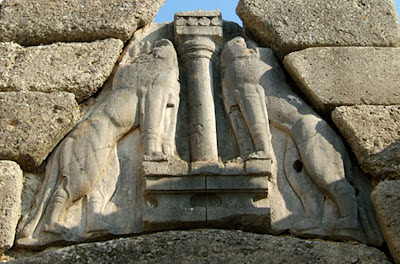 The panel above the lintel, empty in this photograph, would have been ornamented with a similar style limestone or marble panel to the one above the lintel at the "Lion's Gate." 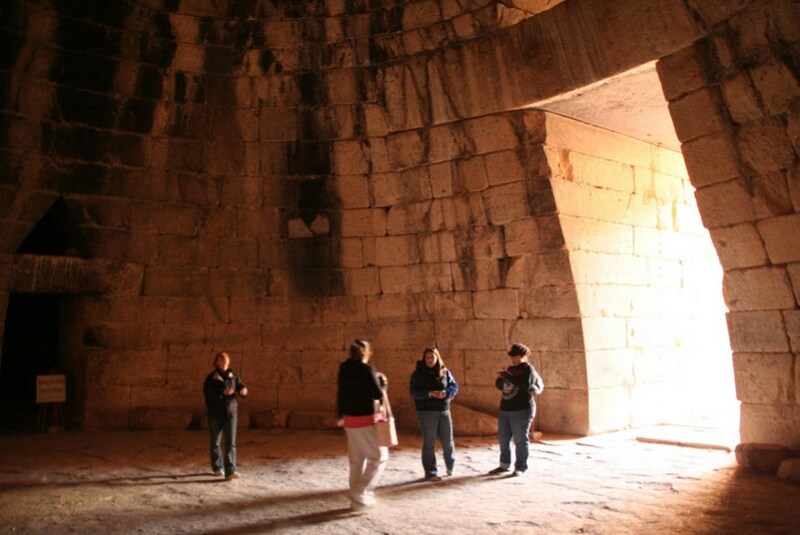 Inside the tomb, at 43 feet high, this dome or tholos (tholoi plural) was the largest dome of its time. The interior of the igloo style dome was constructed from a series of corbeled ashlars that terminated at the top in a pointed cone like shape. These tombs were originally covered by large mounds of earth. Again, as in the case with the mask, this tomb was misnamed the "Treasury of the Atreus" because archaeologists wanted to make the claim that this site was linked to the places and names in the "Iliad." 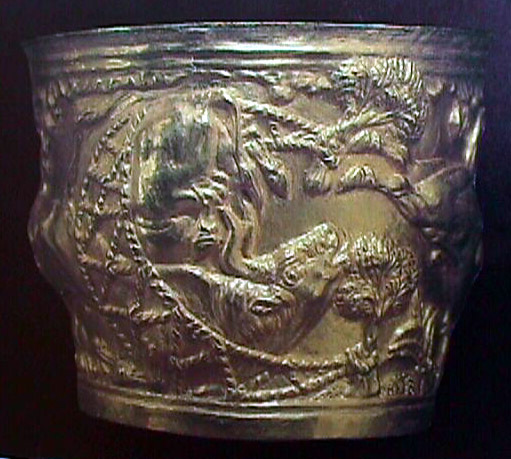 This repousse cup features a double walled construction. It was made out of two sheets of thin gold. The outer sheet was molded and the details formed (some by engraving). 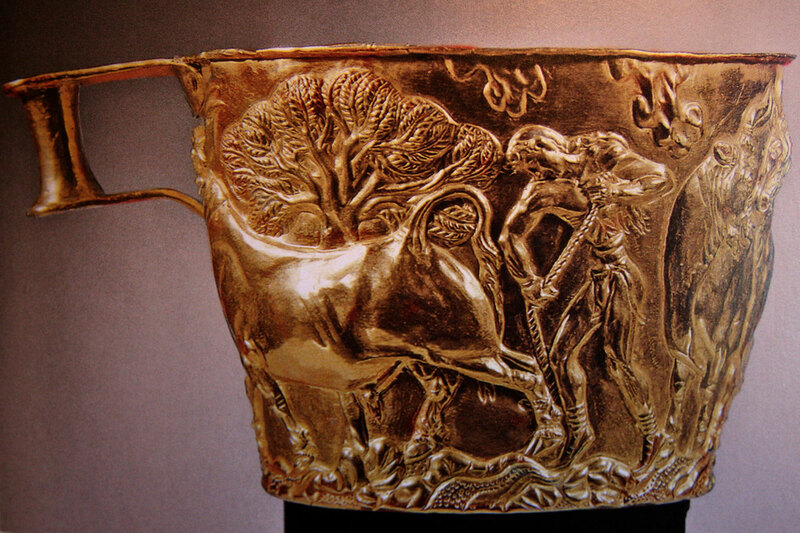 Then this ornamented sheet was attached to a thin sheet of gold so that the interior of the cup was smooth. These joined pieces were then bolted to or riveted to a handle. 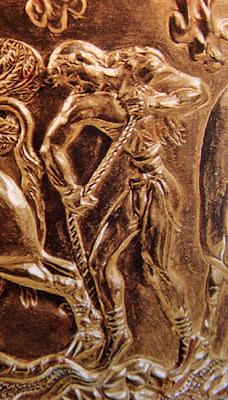 The details of the ornamentation show a surprisingly illusionistic and naturalistic scene of a youthful, thin waisted, broad shouldered young man wrestling with a bull snared with a rope. In this scene there is some space created by the figures overlapping the scenery behind them. The naturalism and stylization of the figures recall many of the frescos at Knossos. 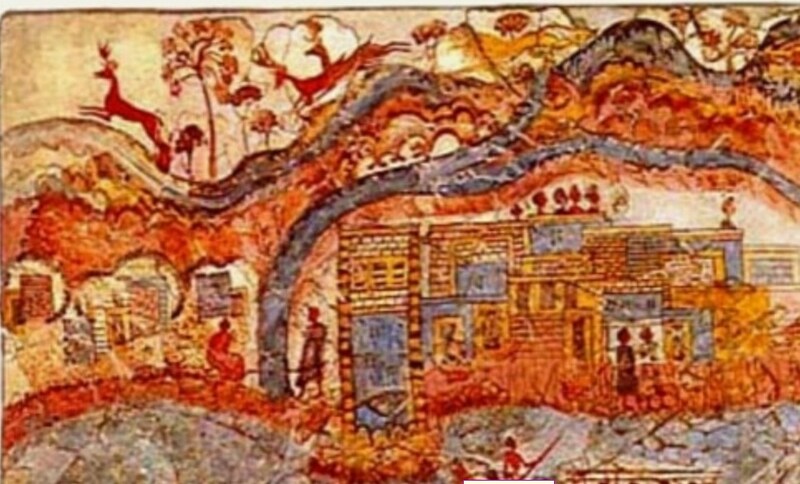 The scene itself is a genre scene similar to those found in murals at Knossos. 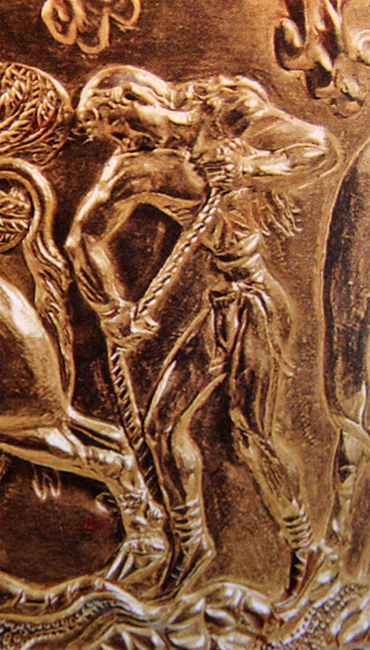 The figures appears to be in ideal physical condition and the scene could represent the ideal of youthful strength and prowess as he heroically triumphs over a bull. The beautiful landscape and the fine animals are possibly reminders or symbols of the property one who is wealthy and strong may acquire. The bull, as in the story of the Minotaur, Mesopotamian art and literature, cave painting and even in Chattel Huyuk represents a powerful, almost divine creature full of male potent energy. If one conquers such a creature it may demonstrate a mastery over these qualities. Perhaps the most interesting thing about this work is its context. Although the work was found in a tomb on the Greek mainland, many scholars believe that this work is stylistically and iconographically linked to Minoan art. Several textbooks and scholars suggest that this work was manufactured somewhere in the Cyclades or on Crete and then exported or that a traveler who visited this region brought it back as one of his or her treasures. These 2 cups were found tholos tomb about 5 miles away from Sparta. It’s hard to figure out the date of these pieces, especially since they were excavated in 1889 which predates some of the archaeological methods that we would use ordinarily to do some kind of dating system including relative dating and stratigraphy. The fact that these were found in a tomb means that they were linked to some kind of luxury good and were treasures placed in a tomb for an important person. Because of the style of these cups, and the iconography on them, it’s very possible to extrapolate that they might’ve been import items from Crete. However the circumstances under which they were found gives us no real evidence for this theory. The theories behind these 2 cups makes sense but their unprovable. 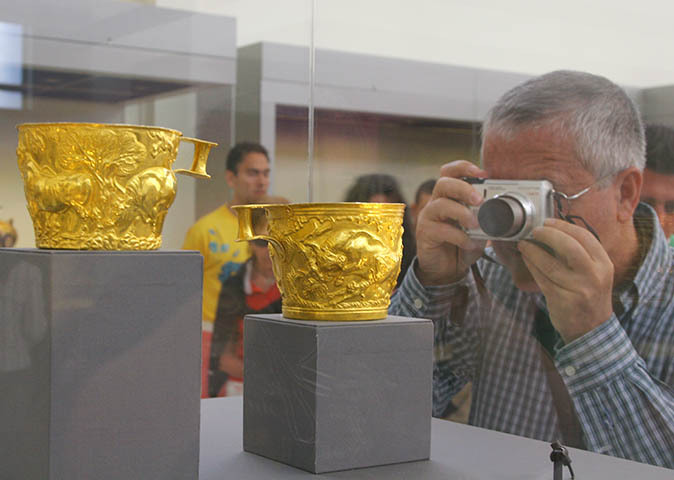 The theory more or less, is that these cups because of the fact that they represent bowls and people who look like the representations from Knossos that these were imported, either that or some sort of loot that was brought back to the mainland, and therefore a type of treasure. Taking these theory further archaeologists have suggested an extensive trade network between Crete and Mycenae. Taking into account the evidence of the written language from Mycenae being found at Knossos and this evidence suggesting that the Mycenaeans took over the island of Crete does somewhat support this. 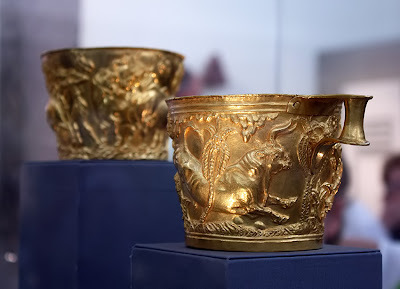 Another theory is that Mycenae was somehow a vassal state to Crete and that the column represented in the Lion Gate at Mycenae and objects like these cups suggest that there was at least a close connection between the two. To write this text have been doing quite a lot of research and reading some of the original text books and documents from the 1930s and 1940s. It’s interesting to note how thesis driven most of these books were. The author begins with the theory or hypothesis, for example one author was discussing evidence that would allow one to believe that the Minoan culture was almost like a pirate Navy that controlled most of the Aegean sees and was constantly invading Mycenae and mainland cities like Tiryns. 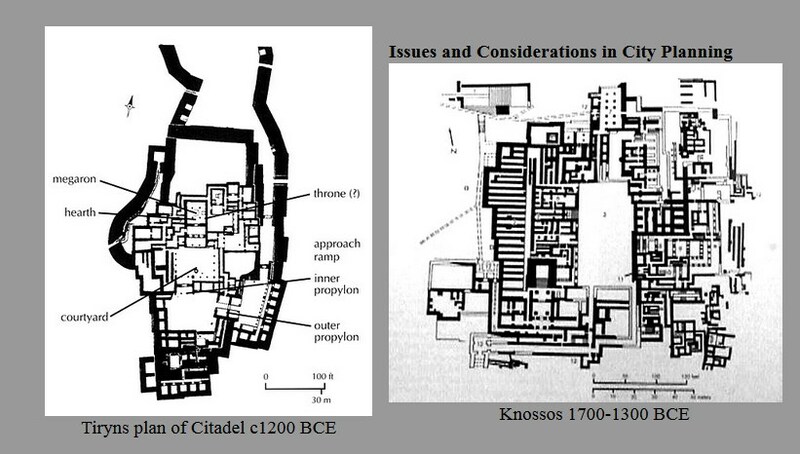 Compared against the latest evidence that suggests the Mycenaeans invaded Knossos the evidence suggests a completely different iconography. The safest way to learn about these ancient civilizations is to learn as many facts based on primary evidence and text as possible and not draw any conclusions about the historical data until we can find a written record that supports either theory. In approaching these two frescoes below I’ll tell you little bit about the theories that people used to explain the iconography and may be take them apart a little bit. 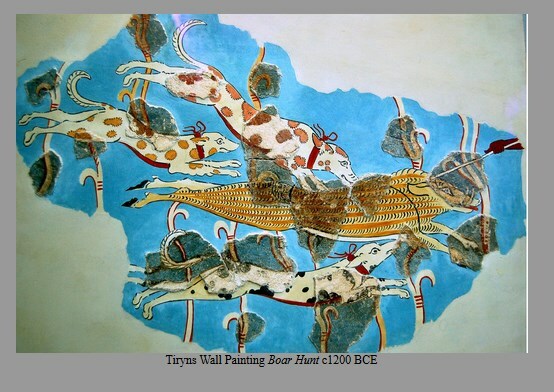 In terms of looking at the frescoes the two groups Mycenaeans and Minoans both have a very similar vocabulary in terms of representing animals and space. They tend to make things flat diagrammatic, there are outlines run most of the figures, and fairly bright colors made from the same kinds of pigments are used. 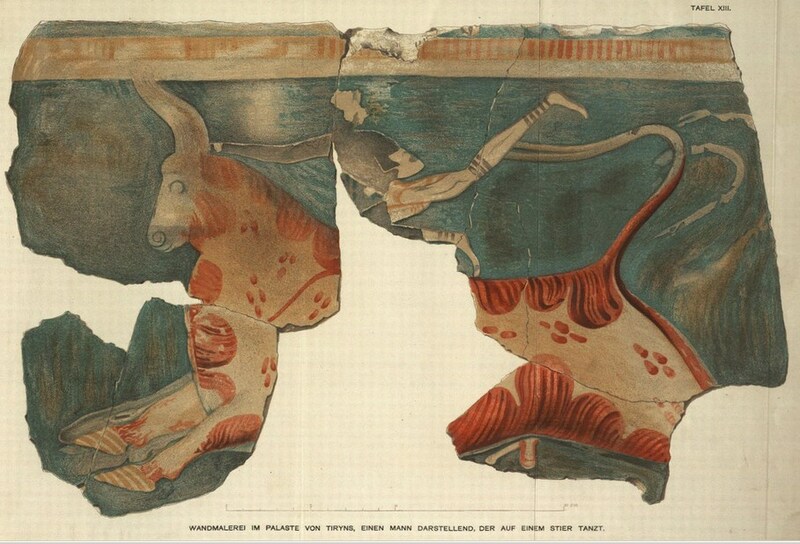 In looking at a cross-section of the two groups it seems that the Minoans used red more. The subject matter between the two civilizations is very similar in most cases showing even the same kinds of women however, soldiers and battle scenes, as far as I know, have not been found at Knossos. We do have the so-called Naval Scene but that doesn’t show war it shows ships on the sea and the island culture. One of the ideas, that’s really more of a theory, that is in most survey level art history texts is the fact that the dogs scene is a violent scene and depicts an aggressive world at Mycenae. I’m not really sure if this is accurate because at Thera they found hunting scenes and there are even some hunting scenes in the Naval Fresco. 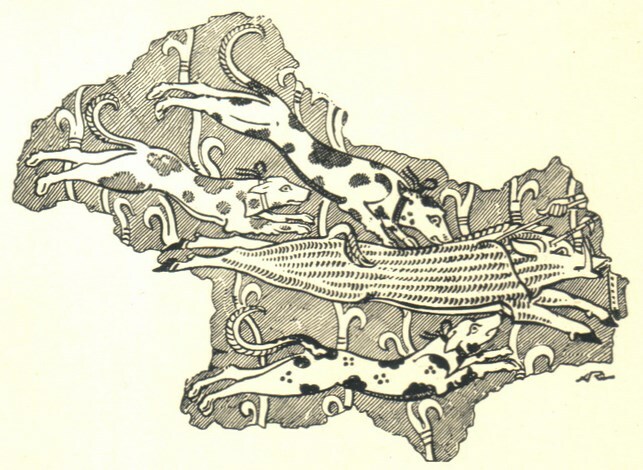 So the iconographic analysis of the hunting scene, while it’s obvious it’s dogs hunting and animal, does not necessarily prove out the warlike theme. A notable exception to this is the iconography on the Mycenaean krater with the hoplite soldiers depicted on it. A more provocative comparison is that there is a fresco found at Tiryns depicts something that could be a bull vaulting fresco. Even though many people have interpreted this as a bull vaulting fresco it’s possible that it is not that. We don’t really have enough of the fresco left for us to make a clear determination. 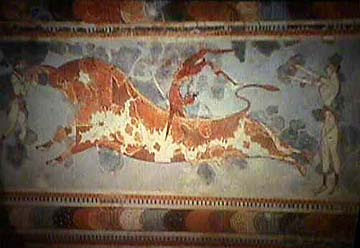 If it is a bull jumping fresco that would only indicate even more of a link between the two cultures and would improve whether or not Mycenae was conquered by Knossos or the reverse.